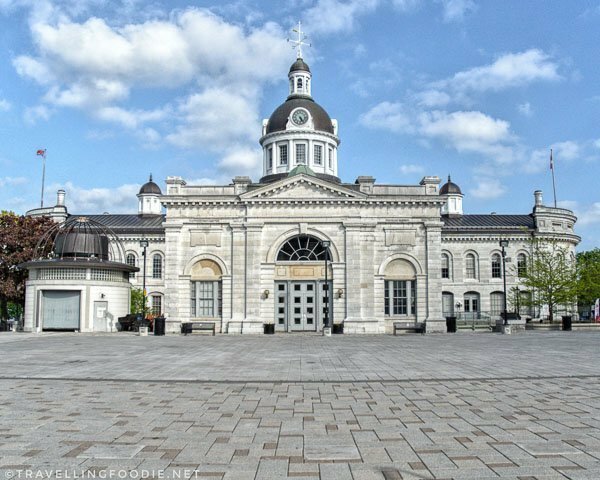 Kingston, Ontario is a quaint city rich in culture and history, but one thing I didn’t know is it has a bustling food scene as well to make it a well-rounded city. 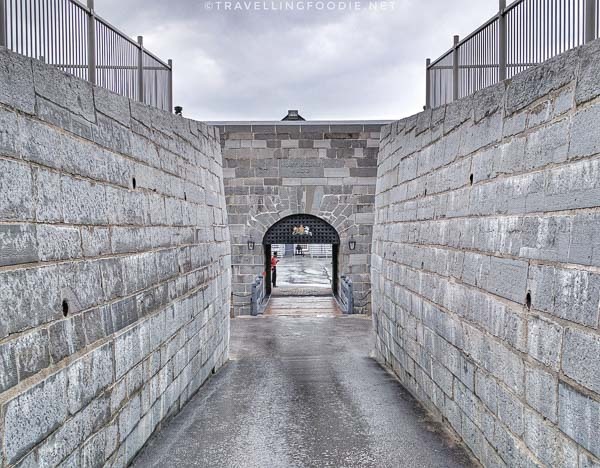 It is located in the middle between Toronto and Montreal, and is at the gateway of the 1000 Islands and the UNESCO-designated Rideau Canal. Did You Know? Kingston was the first capital of Canada, and is one of the Canadian cities with the highest restaurants per capita. I had the amazing opportunity to explore the city on a two-day press trip thanks to Visit Kingston. 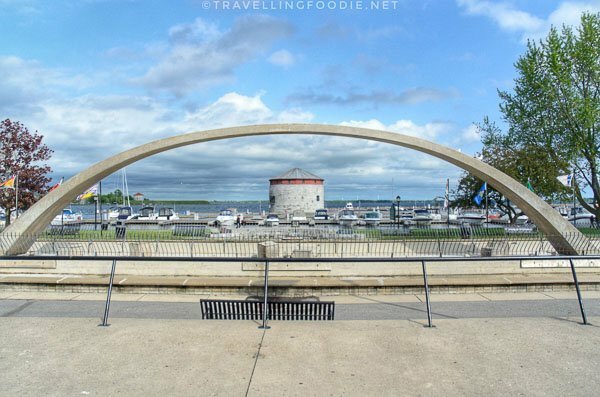 In those two days, I got a great itinerary that highlighted some of the best restaurants and attractions in Kingston, Ontario. 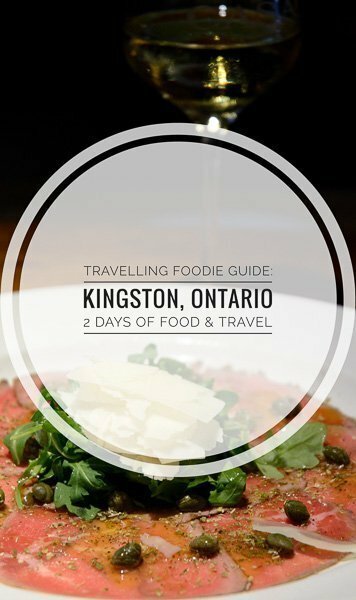 Here’s a video recap of the 2 Days in Kingston, which I’ll be going in detail for this Travelling Foodie Guide. I took the Via Rail leaving Toronto at 9:20am and arriving Kingston at 11:34am, so a good 2 hour ride. 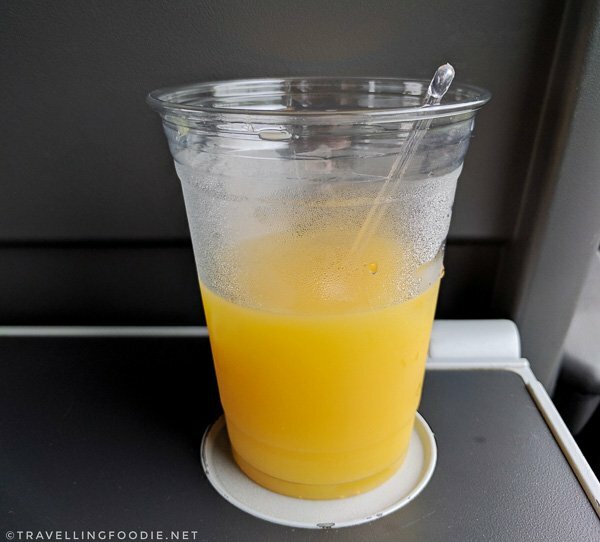 This was my first time being in Business Class, which includes meals and drinks. Yes, my eating and drinking started even before I reached Kingston. For the pre-lunch meal, I had their Chicken Tikka Masala. Upon arrival to Kingston, first stop was to check-in at the Delta Hotels by Marriott Kingston Waterfront. It’s not your typical big hotel, but there’s a small lobby, a restaurant and a bar. 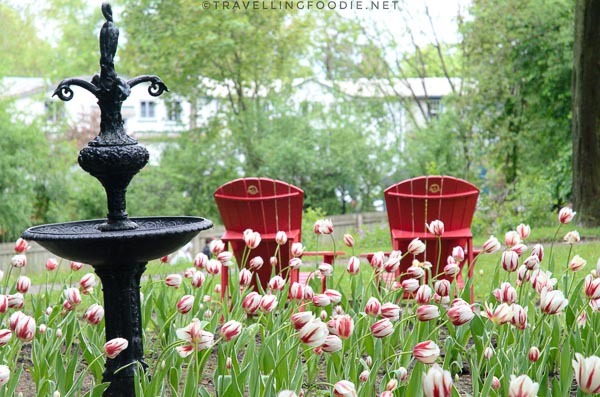 This Delta Kingston Waterfront Hotel is the only Four Star Hotel in Kingston. What’s amazing is it has waterfront views from every guest room. The waterfront views from the room are spectacular as you can see from my video. 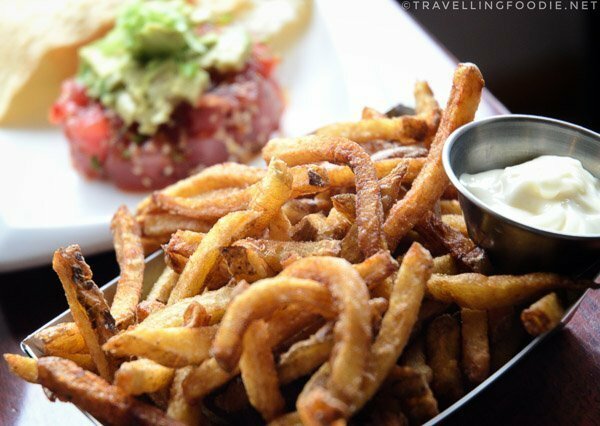 At 12:30pm, it was time for lunch at Le Chien Noir Bistro which serves French bistro classics and modern braisserie dishes. 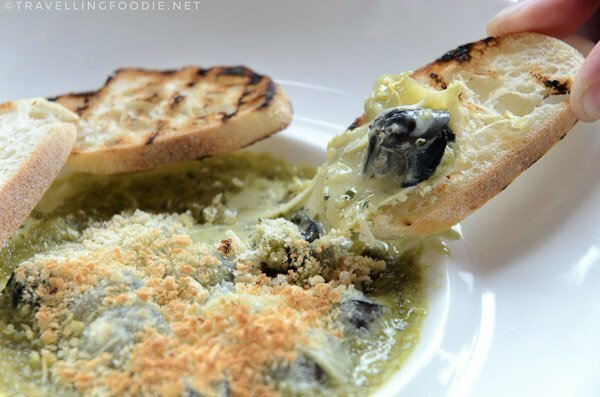 We started with Escargots au Gratin with basil pesto cream and gruyère. This was very unique since escargots are commonly served with butter garlic. It’s very rich but I just love the basil pesto cream! Next was the Tuna Tartare which we got as main course with frites and salad. 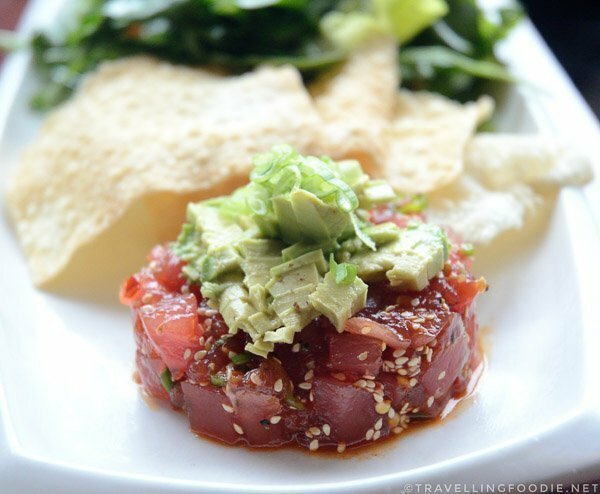 The tuna tartare had avocado, sambal, soy, sesame seeds, green onion and served with wonton chips. So fresh with a slight spicy kick! Loved it! Seeing lamb in the menu always piques my curiosity as I love lamb. 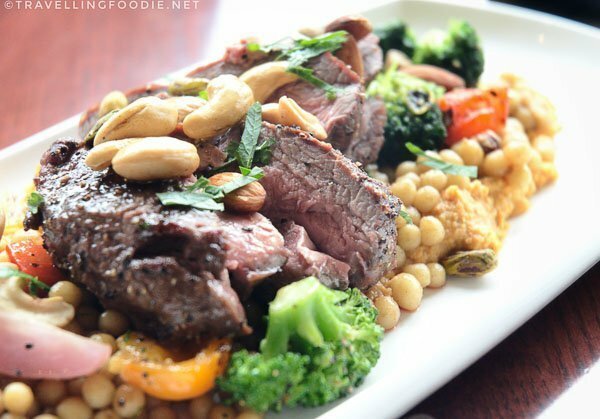 The Grilled Lamb Sirloin was unique because it had Moroccan flavours to it: pearl couscous, dried fruit, toasted nuts, market vegetables, chermoula-garbanzo sauce. So one thing that’s unique this year is that Kingston’s food scene is paying tribute to Canada’s 150 Birthday by creating new dishes that prominently feature local ingredients. At Chien Noir Bistro, they’re serving the Hunter’s Poutine with Québec venison, brie, sauteed mushrooms and roasted shallot jus. You can find the rest of the restaurants participating and their corresponding dishes here. After the lunch, I headed to the Kingston Trolley Tours which is located at the Kingston Visitor Information Centre, right behind the City Hall from the Market Square. It’s south of the Confederation Park Fountain where you can get this perfect framing of the Shoal Tower National Historic Site. The entire tour takes you on a 75 minute guided tour across 9 different stops. You can hop on and off the trolley on each stop, and it takes 30 mins for the next trolley to arrive. Kingston City Hall is actually Stop 1 of the Trolley Tour. Stop 2 of the Trolley is Royal Military College of Canada which is the military college for the Canadian Armed Forces. It also serves as a degree-granting university training military officers for all branches of the military. 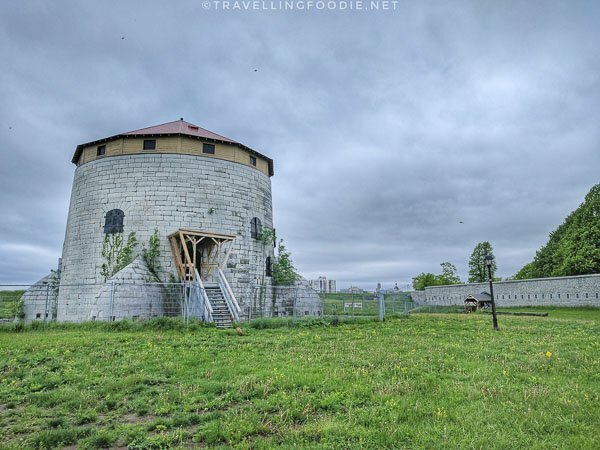 If you walk left from the Trolley Stop, you will find the Fort Frederick Martello Tower, a National Historic Site and part of a UNESCO World Heritage Site. 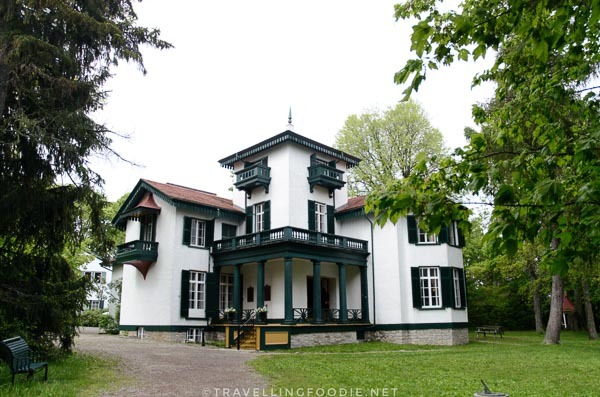 Stop 6 is the Bellevue House National Historic Site, a restored 1840’s home and gardens of Canada’s First Prime Minister Sir John A. Macdonald. There are actual staff dressed in costumes to bring you back in time. For Canada 150, the self-guided tour is free but you can get a guided tour from one of the costumed staff for $7. Inspired by the ideals of the Picturesque movement, Bellevue House was built as a scenic landscape painting in the 1840s in the style of an Italianate villa. 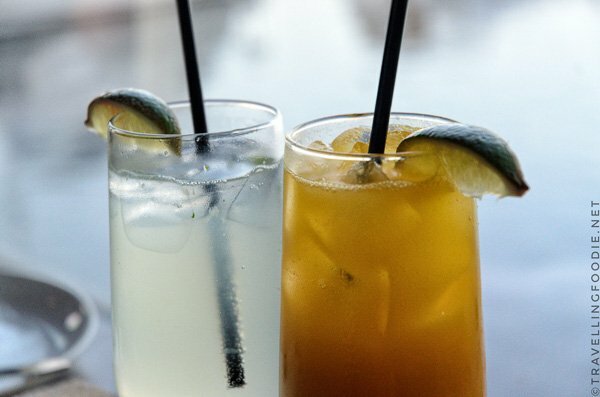 At around 5:30pm starts the food tripping, kicking of the night at Dianne’s Fish Shack & Smokehouse where a classic East Coast Kitchen meets the flavours of Baja Mexico. 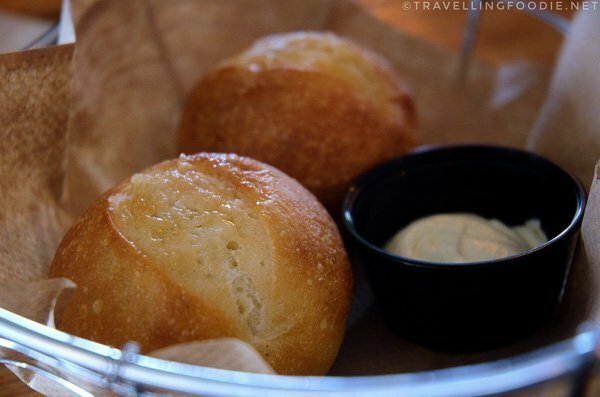 The restaurants serves complimentary fresh warm buns topped with sea salt and a side of whipped butter. The buns were like perfect pretzels – crusty salty outside and soft inside! 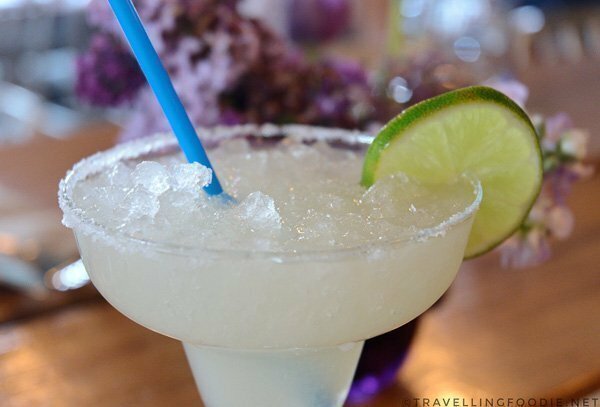 I had their Classic Margarita which features 1800 Blanco tequila, patron citronge and freshly squeezed lime (which is paramount!). This was so refreshing I had two. 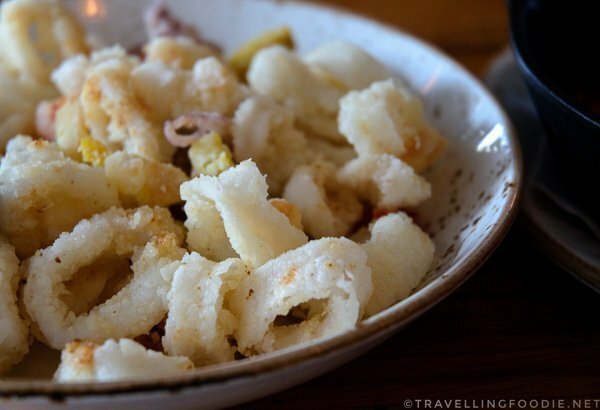 I’m a sucker for calamari so, when I see it on the menu, it’s always something I want to get. We got the Spicy Fried Rhode Island Style Calamari with fried pickled peppers and arbol chili mayo. This was very fresh that you can really taste the squid. I usually try looking for something unique in the menu. 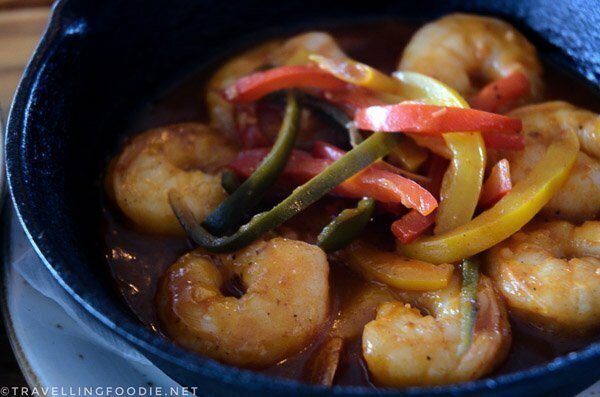 One thing that popped out was the Tequila Shrimp: shrimps on tequila-tomato broth with sweet & smokey pepper slaw and garlic served on a sizzling skillet. Next hop was Casa Domenico for some Italian style cuisine prepared by Executive Chef David Faroldi. 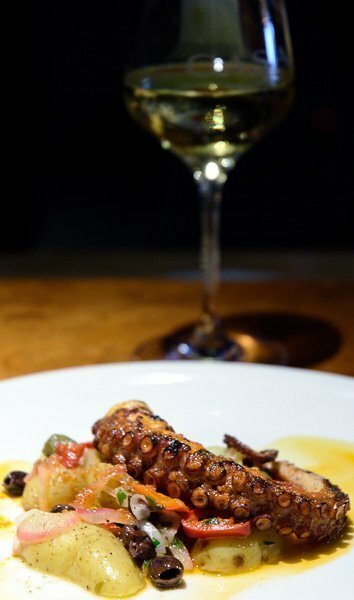 Since we had calamari at Dianne’s already, I gravitate to the next similar item, Polpo alla Griglia, which is grilled octopus with hot peppers, black olives, parsley, capers, warm lemon potatoes, red onions and tomato oil. This was probably one of the best grilled octopus I had – grilled to perfection and very tender. We paired this with Red Rooster Chardonnay. 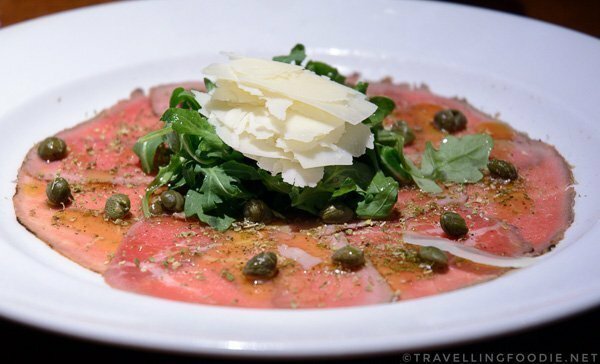 Our second dish was the Carpaccio di Manzo – thinly sliced beef, extra virgin olive oil, capers, parmigiano, arugula with red whine vinaigrette. I absolutely loved the mix of ingredients here but would’ve preferred less olive oil. Our last stop was dinner at AquaTerra which is actually at the Delta Waterfront Hotel. 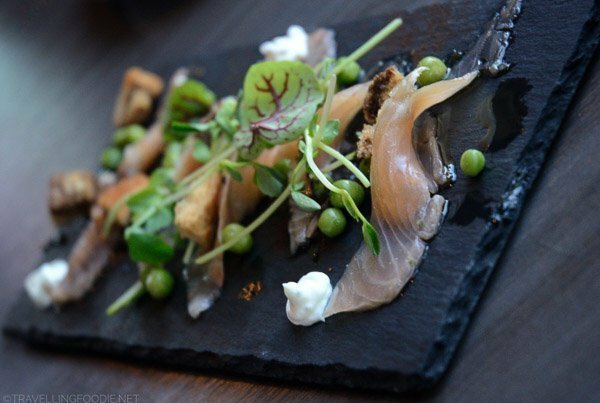 AquaTerra focuses on New Canadian fare emphasizing on fresh and locally sourced ingredients. The drinking continues as we start off with some cocktails. I got Gin and Tonic. There were complimentary amuse bouche and in-house focaccia bread from the kitchen. 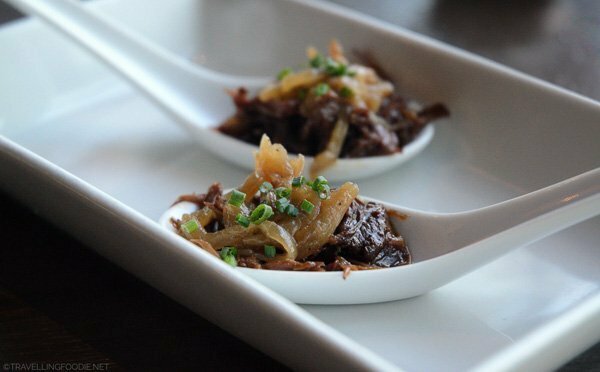 The amuse bouche was short ribs and it was very tasty. We started off with something I’ve never had before Gravlax: citrus cured salmon, leek ash, smoked Upper Canada yogurt, Mill Creek peas, K.O.O.C. olive oil, lemon gastrique, pea tendrils, rye croutons. We paired this with the Anakena Vineyards Viognier. 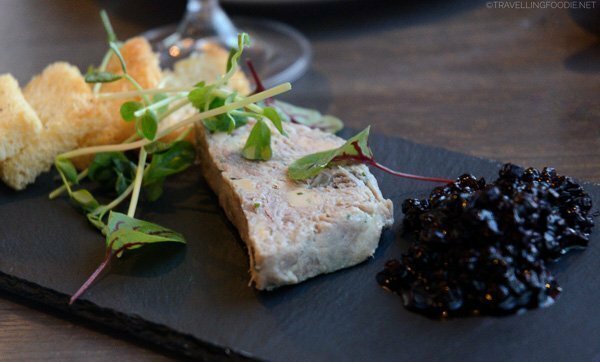 Our next item was the Duck Terrine: duck confit, foie gras, blueberry cognac compote, brioche toast. I’m a sucker for duck too so I really wanted to get this. The terrine was creamy and very flavourful. I found it went better with the in-house focaccia than the brioche. 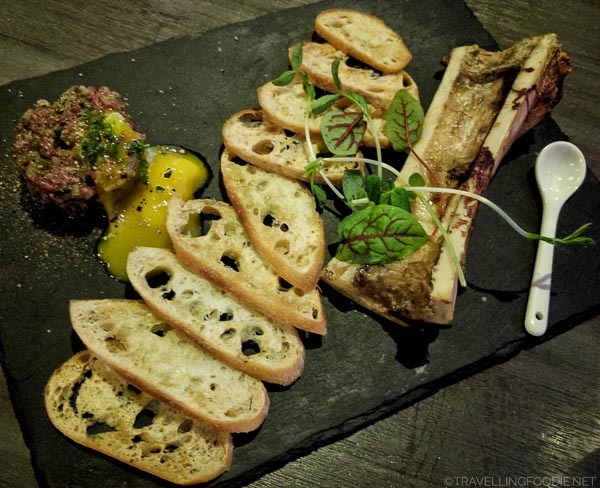 Third appetizer was Tartare: steak tartare, 63 degree Beking egg, crostini, roasted Enright Cattle Co. marrow bone, Mrs. McGarrigle’s grainy dijon. This was my favourite in the dinner, especially after paired with Meerlust Estate Rubicon. 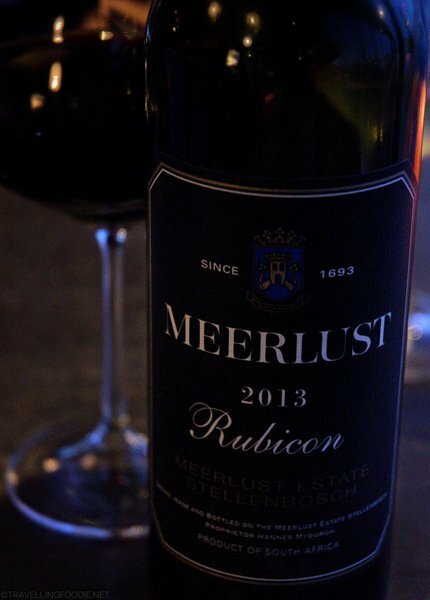 The Rubicon is an eye opener for red wine for me with its blend of Cabernet Sauvignon, Merlot, Cabernet Franc and Petit Verdot. 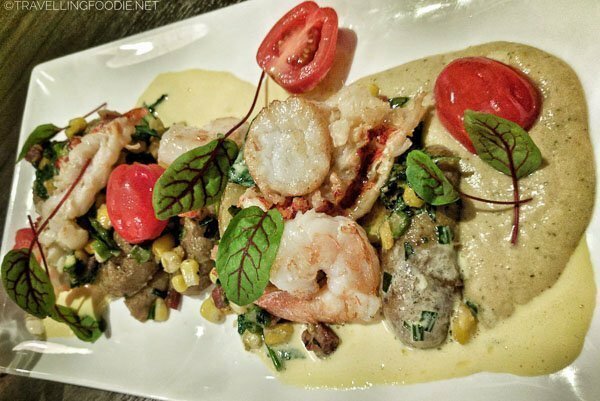 For the main course, we chose the Seafood Special that night which had a combination of lobster, scallop and shrimp. What a way to end the night! After a great day of touring, eating and drinking, I was ready to get some sleep. Day 2 started early with Pan Chancho at 7AM for breakfast. Pan Chancho was opened by the original founders of Chez Piggy restaurant, Rose Richardson & Zalman Yanovsky, to provide hand-made bread to be used in Chez Piggy. It has since then grew to include a cafe and restaurant as well. Waking up this early calls for some caffeine. I had their cappuccino. For my breakfast, I wanted something filling since I had a long morning of touring before lunch. 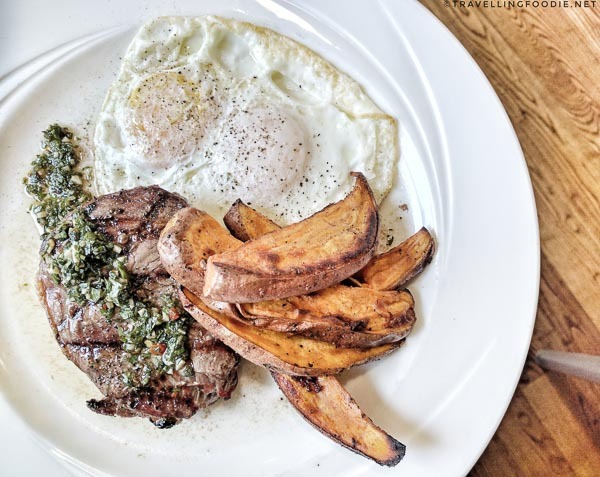 I went for the Steak & Eggs: 6oz Enright Cattle Co. rib steak, two over easy eggs, chimichurri sauce and roasted yams. The steak was tender and juicy, and I enjoyed the addition of chimichurri sauce on it. 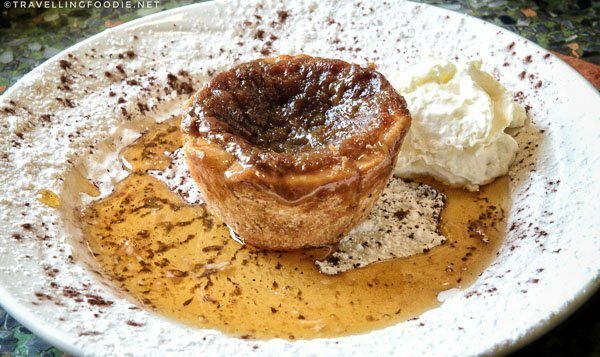 Craving something really sweet after, I chose the Maple Butter Tart. The tart was flaky and crusty with strong maple taste! After breakfast was Kingston Pen Tours at 8:30AM where you get a tour of the high security Kingston Penitentiary with speakers who worked at the pen before it closed on September 30, 2013. 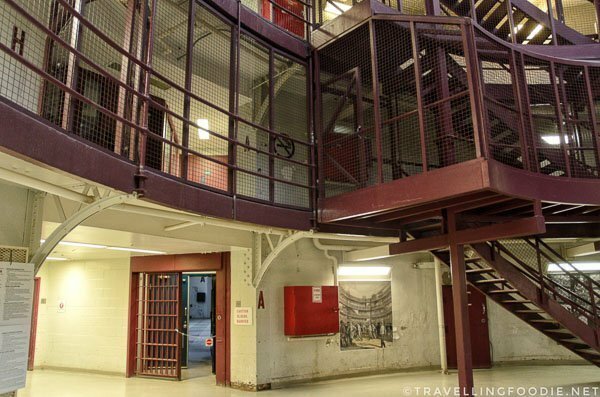 Kingston Penitentiary National Historic Site held Canada’s most notorious criminals: Paul Bernardo and Clifford Olson (serial killers), and Tyrone Conn (famous bank robber). 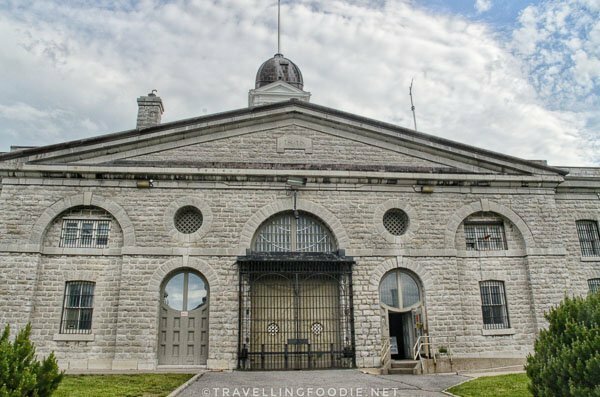 At 10:30AM, I headed to Fort Henry. 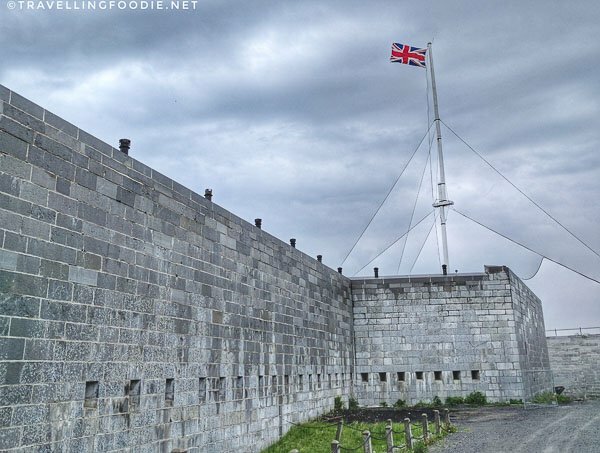 A UNESCO World Heritage Site, Fort Henry was built from 1832 to 1837 to replace the original fort constructed during the War of 1812 era for the British to defend against the Americans. It was never attacked though. On the way to the entrance, you’ll find the west branch ditch tower (there’s an east branch too). These limestone ditch towers, each armed with a cannon on top, are 13-m in height and 9-m in diameter at the base. The guided tours start just before the drawbridge. After Fort Henry was lunch at the popular Chez Piggy, one of the oldest restaurants in the city opened since 1979 (Pan Chancho was opened in 1994). Chez Piggy is at a former limestone stable and serves globally inspired dishes. 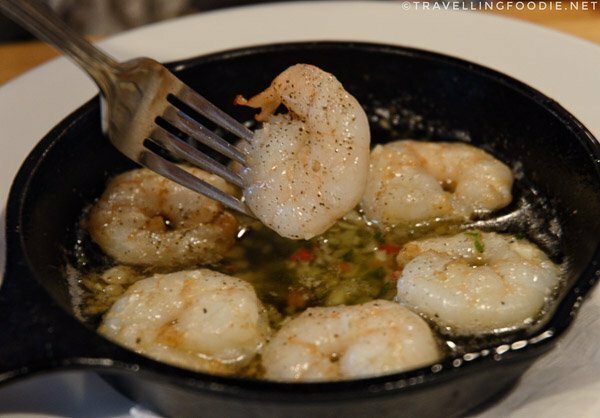 We started off with Gambas al Ajillo, a popular Spanish dish, which is shrimps on garlic and olive oil served in a sizzling skillet. When you see the oil with garlic high enough to be midway of the shrimp, you know you’re in for a treat. Travelling Foodie Tip: Dip the complimentary bread on the garlic oil, and thank me later! 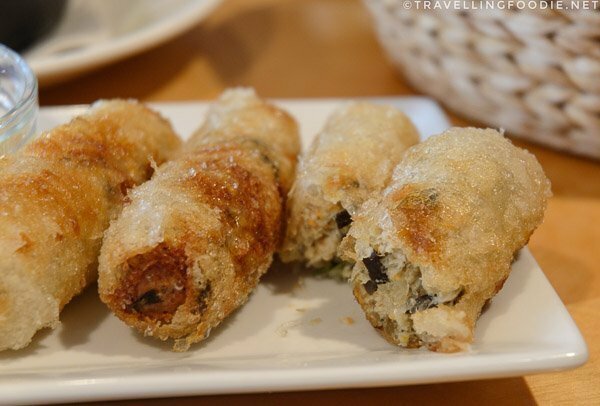 Next up is one of their most popular items, Châ Giô which are Vietnamese spring rolls with shrimp, chicken and pork. Owner Zoe said they actually have to get one person dedicated to just making these rolls, as they can serve upwards of 200 orders in a day. 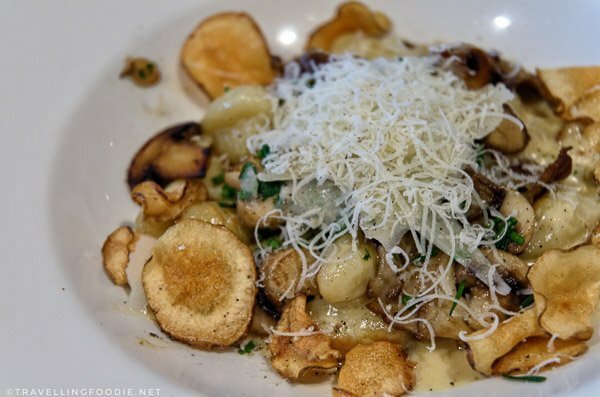 For the main, we got the Creamy Mushroom Gnocchi, which was such a delight. The gnocchi was perfectly aldente and was breaming with flavour with the crème fraîche sauce, pecorino con pepe and sunchoke chips. At this point, I was supposed to leave and go to the 1000 Island Discovery Cruise at 1PM. However, it got cancelled due to weather. 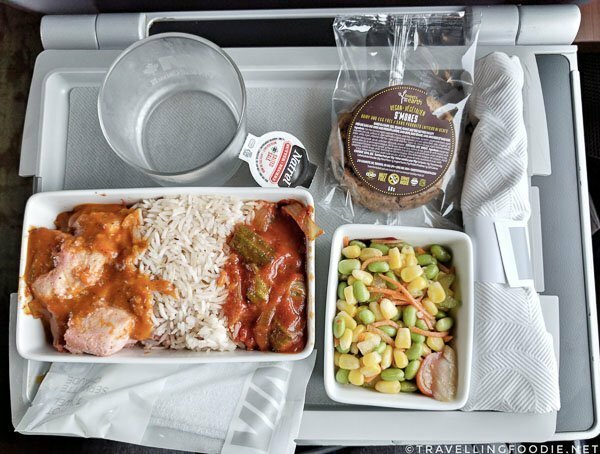 So what does a foodie do? Order another dish. I haven’t had much desserts in this trip other than the Maple Butter Tart, so I decided to go for dessert. 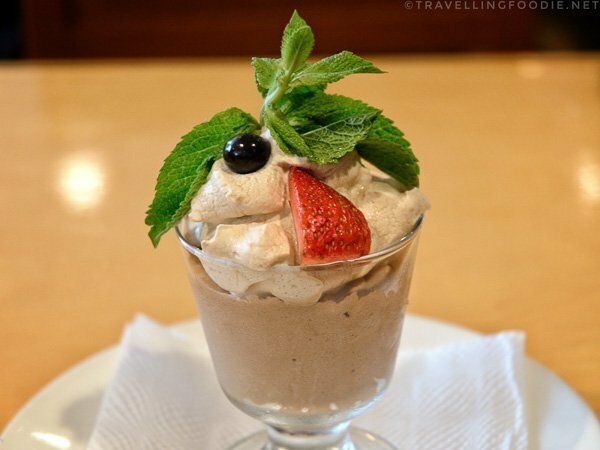 Hazelnut is one of my favourite for chocolate so when I saw the Gjunduja Mousse with hazelnut, I wanted to try it. I’m not so rushed anymore since the cruise got cancelled. 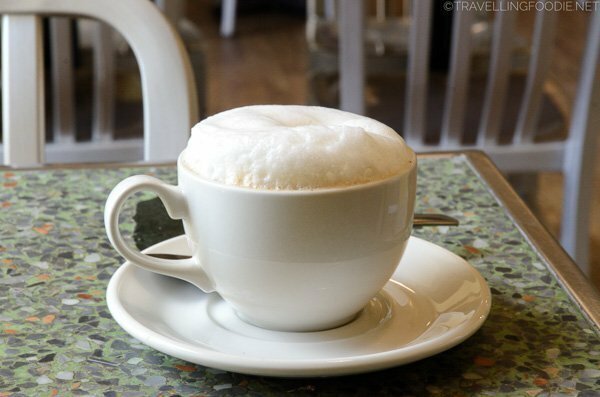 I decided to stroll around the city, and get a cup of Mocha at The Common Market. 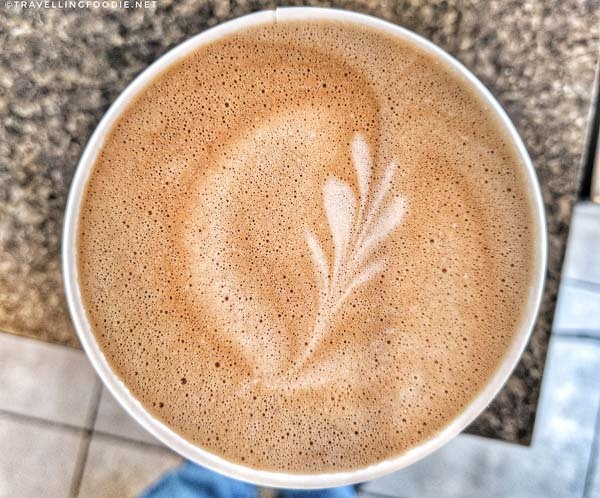 Their coffee beans are organic, locally roasted and rainforest alliance certified. My 2 day trip to Kingston ends here as I go back to the Delta Waterfront Hotel to pack, check-out and take the Via Rail back to Toronto! 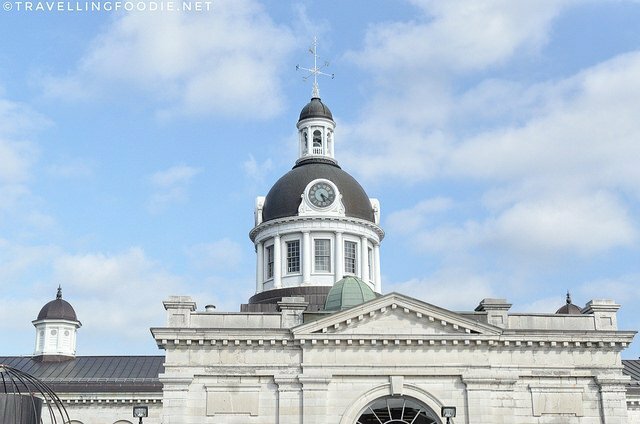 Hope this guide helps you plan out your trip to Kingston, Ontario! You can follow exactly what I did, or change them up to suit your preferences! Either way, I’m sure you’ll have a great time like I did! DISCLAIMER: Though this was an all-expense paid press trip with Visit Kingston, all opinions are my own. 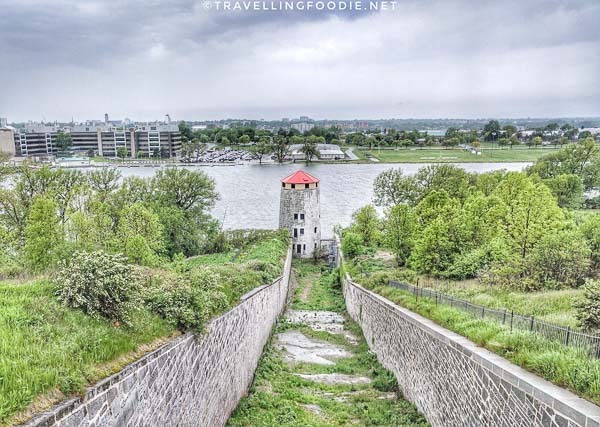 Posted on June 5, 2017 January 2, 2019 by Travelling FoodiePosted in Canada, Kingston, Ontario, TravelTagged accommodations, guides, nature, restaurants, sights and landmarks, transportation.